"We kissed on the lips! Whoo hoo!" Elliott said, after having his first kiss. This candid kiss has become our pick for the "best kiss on video" ever! Jeff and I started out as friends, but we had an instant connection when we met, and got along amazingly. I was only 18, and never had a boyfriend before. During the month of June, we became even closer. We were always together and frequently visited this one park that overlooked the water. We sat on a bench there just talking for hours, laughing and having a great time. Three weeks after we decided to give dating a try, we had our first kiss. We were sitting on the bench, at the same park we always went to and having a great time as usual. But I wasn't very smart, because I missed Jeff's first THREE attempts to kiss me. First, he leaned in close, and not realizing the moment, I turned my head away. The second time, Jeff was tickling my neck, because I'm ticklish and I closed my eyes, when I opened them again, he was just about to kiss me, then backed away really quickly. The third time, he tried to tickle me again, in hopes that I would close my eyes... I didn't. I was just not picking up on the signs at all. Until finally, he asked if I saw the police car go speeding behind us. I turned my head and when I looked back, Jeff was right there, and that's when he finally kissed me. We're currently dating long distance, since we're at different schools now, but it's working. We both still love each other, and we're able to joke about my inability to read the signs. The picture (above), was taken a few weeks after we first met, about a month before we decided to start dating. Jeff and I decided that when he proposes, he will have to ask me four times. Zach and I have been dating since our sophomore year of high school. We're now juniors in college (ages 20 and 21) and are loving every minute of each other just the same if not more. Our first kiss was after a football game. He had asked me to walk him to his car and while we were saying goodbye I accidentally shut his car door without a thought. I suppose I should mention that it was running, and locks when the door closes WHILE it's running. So, needless to say we were stuck outside in the freezing cold-with a running car that was locked from the inside along with the keys. Soon enough we had recruited a large group of boys, police officers, and parents using hangers and makeshift monkey wrenches, trying to free up the lock. After two hours of waiting and desperately trying... our hard work paid off! We heard a click and the lock raised in the window. In our fast moment of relief and happiness he grabbed me, looked at me, and kissed me. It was perfect in every possible way... I'm not sure if I ever stopped smiling that day. It wasn't until that day that I realized that this was serious, but soon after we both realized that regardless of where we were at in our lives we were going to last. We didn't know why, we didn't know how... we just knew. We had always been complimented for not being a typical high school couple because of our unique connection and mature way with each other. We knew we weren't the only ones who saw it. In fact, we had no idea how to explain it. We just knew. Here we are five years later with so many aspirations and dreams. We never tire of each other and being in love never gets old. What a wonderful feeling. Earlier today I stumbled onto your website and fell in love. It is such a beautiful expression of how kisses of all kinds can cure the world with love and joy. After looking at the site more, I knew I had to submit a photo. The photo is my boyfriend and I locking eyes and "eskimo kissing" at my birthday party earlier this year. We have been in a long distance relationship for a year and have been dating on and off since we were in high school. Our first kiss happened when we were both sixteen. It all started in History class. The class was seated alphabetically and my boyfriend Jake, sat in front of me. Every class, the cute boy with black curls would turn around and try to make me laugh - while getting in trouble for talking during class. I often wrote reminders to myself on my hand when I was younger so I wrote "tell him" on my hand. This was meant to encourage me to tell him that I liked him. Truthfully, I knew I loved him. I didn't tell him for two weeks, by that time we were both going on a trip to Disney World with our High School's music department. I boarded the bus hesitantly with my best friend and her boyfriend. I knew that Jake would be on our bus because of our last names. He was on the bus already when we walked on and my best friend and her boyfriend sat down in the seat across from the seat he was in, almost forcing me to sit down next to him. I asked if I could sit with him and he said "sure." As the ride began, not even an hour into it, his hand slid across the vinyl seat and laced between my fingers. I looked up at him and said "Jake, I have to tell you something", he told me he knew before I could say it, and grabbed my chin, leaned down and kissed me. My lips were so electric and my heart fluttered more than it ever had for any other kiss. I knew he was the one. Six years later, he's still my best friend and now he's my boyfriend. I have never been more in love with someone in my entire life. I don't think I will ever love anyone more. Our first kiss will forever be ingrained in my memory along with those heart flutters and electric feelings. Jeremy and I met eight years ago, when we were 17 and 19, while on a month-long primitive desert survival course in Utah. I knew instantly that I was in trouble. His eyes alone made me weak. We took care of one another, slept together for warmth and became steadfast friends. I think a combination of the program rules, teenage naiveté and exhaustion kept us chaste. However, I was madly in love with him. Our first kiss was a kiss goodbye at the airport, amid a crowd of waiting passengers. I was simultaneously elated and crushed. I was off to California; he to Maine. Over the years, we kept sporadic touch which eventually dwindled to near nothing. Phone calls and letters petered off--we were off doing very different things. College, jobs, and traveling took us all over the place. I sent postcards to his parents' homes periodically, whenever I was traveling. I didn't know how he was receiving the postcards, or if he received them at all. I enjoyed writing to him, even if he never saw the cards. I had boyfriends but always thought of Jeremy. A few times over the years, a boyfriend would declare, "you're the one for me " and i could only be honest and reply that I wasn't sure. There were so many people in the world and I wasn't ready to settle in with anyone. Jeremy remained an unanswered question for me, an open book. Last fall, while endlessly bumping along in an old Russian Jeep with my dad in Mongolia, I decided I had to find him. I had nothing to lose. Maybe I had "Great Gastby-ed" him--dreamed him up to impossible proportions! Maybe there was no longer anything between us. Maybe he was married. Maybe he hadn't thought of me in years. But maybe he had. I wrote to our old program for any contact information as soon as I got home and wrote to him. A couple hours later, I received his reply. Our second first kiss was this February, nearly 8 years after we first met. I was sick with excitement and terror. We were confronting years of expectations! I was no longer 17 and timid and he did not disappoint. We sometimes discuss our frustration at lost time and our own folly. We wonder why we didn't get together sooner. Jeremy tells me that he wasn't ready for me back then. I think that is true for me as well. Soon after our second first kiss I realized I was ready to close my open books. I no longer wondered about "what ifs." I didn't need to meet all the people in the world. I just wanted one. I was finally ready. My husband recently returned from a full year in Iraq. My children and I spotted him almost immediately in the sea of ACU's in the formation on the parade field. He spotted us as well, as we were standing in front of the massive crowd of people with our banners and a full sized American Flag waving up high in the air held by our daughter, in the anticipation of the race to get to him and hold him in our arms. When the soldiers were all released from their formation, we raced across the parade field as fast as our legs could carry us, to welcome home the brightest light of our lives. My dear, loving husband. Next to our very first kiss, the kiss to welcome him home was the best kiss ever!! Gaston had a crush on me when I was in school, although I didn’t know him and had never spoken to him he asked me out. A friend we had in common told me about him, and then I accepted to go out with him on a date. Even though we were both very nervous, I really liked him and we both had the feeling of knowing each other for a long time. In the picture, we had been going out for only a week hanging at a friends house and I told him I wouldn’t want to fall in love with him. He told me that he’d been waiting for that moment and then we kissed for the first time. It’s been almost one year of being together, and we have a feeling that it will last forever. It’s just like the song "You are my sunshine, my only sunshine; you make me happy when skies are gray…" He reminds me everyday that I am his sunshine, and I know he will always be mine forever. I recently visited your site, thanks to an article I found in the February issue of Reader's Digest Magazine. I must admit, I was (and I still am) impressed with your history and your willingness to show the world the power of a "simple kiss". Here's my story. About two years ago, a very good friend and I were lonely, both of us knew each other through common friends for years. At the time we were single, then our friendship became something more. 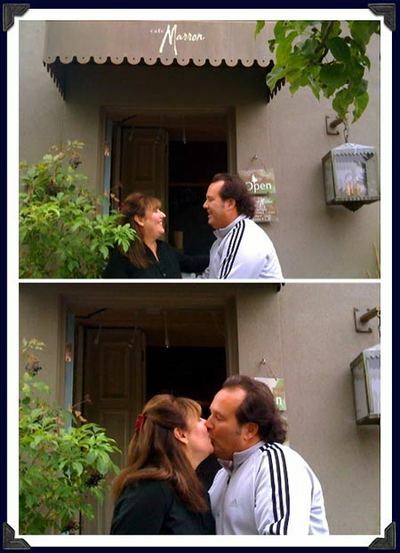 It happened with a kiss. One day we both found ourselves attending a party at what was almost an abandoned house and some friend captured this moment when we were both wrapped in a kiss. Many people who saw the picture, said it was amazing. I had to agree. It was one of the most amazing kisses in my life, so that's why I decided to send the picture to you. Will was my first real relationship and I had never kissed anyone before him. Everywhere one of us went, the other would show up. Obviously someone wanted us to be together. I started over thinking everything, I was so scared of being in a relationship because I had never experienced it before. I told Will I just wanted to be friends. He thought differently. He was very patient with me and we talked for hours. That night I grabbed his hand at church and our fingers stayed linked through the entire class. I told him I was sorry for my stubbornness before and told him I had just freaked out a little. I knew he would be my first kiss, and I was so excited and so scared. We were sitting in one of the many wooden swings on campus. I knew he wanted to kiss me, he kept nudging my chin very gently but I kept my face down. Finally, he asked me if I was serious about what I had said before (about how I really did like him and was just nervous), I said yes. Will said; "So it wouldn't be awkward if I did this then?" and he kissed me. I hugged him so tight after wards. We just sat there hugging each other, both of us completely happy. I used to be so embarrassed by the fact that I was in college and had never been kissed. Now I am so proud to tell people that my HUSBAND is the only guy I have ever and will ever kiss! We wanted to post Kelsey's story because of our common passion for collecting kissing pictures. It would be safe to say that Kelsey is a kissing photo fanatic. We thought it best to share her story in her own words as it was written to us in an email. "I have never, in all my years of internet searching and pursuing, found such a beautiful, well put together, artistic site before. For the past decade or so I've been collecting pictures of people kissing," Kelsey said, "My walls are adorned with posters and framed photographs, my desktop background is me and my boyfriend smooching and I always, always ask for more pictures with each birthday and Christmas." "Your website was like a God send! I cannot express how much it pleases me to find a site like yours. I am so happy!! Thank you so much for putting it together and maintaining such a beautiful and creative idea. I love it!!" Thank you Kelsey, for making our day a whole lot brighter. For Tyler and Tia, dating started after their very first kiss. On the morning of June 1, 2007 Tyler sent Tia a text message that read; "I can change who your last kiss was". After being together on three different occasions, Tia was disappointed that nothing happened. She realized that Tyler was testing her to see how she would react to his text message, professing kisses of grandeur. Tia quickly realized that she would have to take matters into her own hands. After a quick supportive phone call to a close friend Tia drove back to Tyler's house, she called him outside, walked up to him and said; "You cannot say what you did earlier without doing this," and then she kissed him. "Once we stopped kissing I turned around walked to my car without saying a word, he stopped me and then asked me out." Tia said. These two have been going strong together ever since and it all began with that first kiss. Here's a heartwarming update to our "Flat Daddy Kisses" post where we featured seventeen month old Cadence kissing the life-size, cardboard cutout of her Daddy while he was attending Ranger training down in Georgia. Little Cadence can finally put away her "Flat Daddy" for awhile since her bigger-than-life Daddy returned home at the beginning of September. Mom Shannon told us that her husband won't be deploying again until sometime next year. "Daddy is home now and Cadence can't get enough kisses from him," Shannon said, "Thank you so much for putting a story with the picture, it really means a lot!" The picture below was taken the day Cadence first saw her Dad after his return. The picture above was one of many kisses Cadence has been saving up for her Daddy. We wish Shannon and her family many more happy days ahead. We knew almost a year ago that our daughter Rachel would be heading off to college close to our 24th anniversary on September 22nd, 2008. As it turned out our college road trip with her began on September 19th. Change has a way of creeping up on you just when life in cruise control starts to feel comfortable. Our anniversary kiss this year was another one of those unexpected moments for us. A friend of ours recommended we visit Cafe Marron while staying in downtown Spokane, out in Eastern Washington. It's a quaint little restaurant tucked inside one of Washington State's oldest neighborhoods called Browne’s Addition, established in 1883. We enjoyed an amazing breakfast there that felt like time stood still for us, especially with so many emotions swirling inside over leaving our little girl behind. We returned to the Cafe in the late afternoon, because it really felt like home for Terri and I. We stayed for hours and even decided to post this week's kisses while camping out together in the corner booth. That's when we came up with the crazy idea to launch our anniversary kiss right then and there. It was the perfect place to kiss. One of the staff captured our kiss and then we added it to Best Kisses so we could seal that incredible moment forever. It wasn't easy having to say good-bye. When we visit Rachel again, we intend to return to Cafe Marron for the amazing food, the friendly staff and our beautiful home away from home. It's left a meaningful memory in our hearts during this season of great change. Long distance love, does it work? We can't speak for the rest of planet earth, but Rachael and Brendan believe that love is not limited by miles. Rachael was quick to admit; "We don't have the most conventional relationship being so far away, but our time together means so much," she said. With technology tools like Skype, text messaging, email, web video, unlimited calling and instant messaging, communication can be instantaneous making the distance apart seem not so far away. Giving long distance love a greater chance to thrive. Rachael and Brendan will celebrate their three year anniversary on September 16th. That's a long time for a couple keeping separate homes in Colorado and South Carolina. "We won't be able to be together," Rachael said, "I wanted to post another picture of us to show him just how much he means to me." 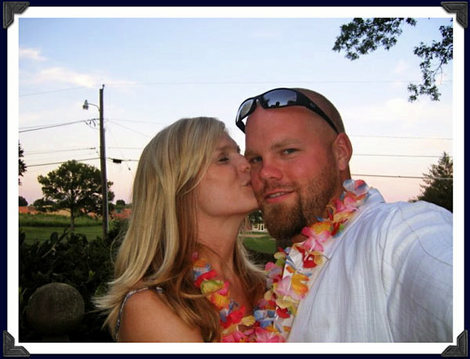 We wish Brendan and Rachael much love as they continue to blow kisses to each other across the miles. Long distance love can work, if you let it. Thanks for sharing your story with us. Jessie and Chris have started an inspiring kissing tradition that we wanted to share. They kiss each day at the same time, 7:53 p.m whenever proximity allows. Jessie told us that they came up with their "kissing time" based on military time of 19:53 which is a combination of the numbers on Chris and Jessie's softball jerseys. "Kind of cheesy," Jessie said, "But it's a good daily reminder that we will always be there for each other. It’s even a great reminder of our love when we can't be together at that exact time, in which case I always just smile or kiss the clock." Chris and Jessie have been married for two years but dated for ten years before they finally tied the knot. Their committed love for one and other has always clicked, just like clockwork. We wish you both many years of love and kisses that are right on time. Thank you for sharing your story with us. How strange! I read this at 19.53! AAH@! I read this at 7.53 pm! 19:53!!!! same here 19:53! strange and the stories were beautiful. I identify with the kissing story of Rachael and Brendan because me and my boyfriend live in different countries also..
And long distance relationships do work! Whoa! How can you do it at 7:53 exact? Any Seconds? I kissed my first love a few days back, after 8 years of being in love with him.Because I had never told him about my feelings and we were apart for 5 years. But now I have a boy friend of 4 years. Still that first kiss with him remains the best kiss and it will remain so forever..
My best kiss was with a 6th grader when I was in 7th grade. He was a good kisser for a 6th grader. I will forever remember that day on the school bus when that kiss happened between me and him. wow, I read this at 7:41, and I bet if I hadn't skipped some stories, I would have gotten to theirs at 7:53! tripppyyyy! It was Halloween.... not exactly the perfect setting, but it was a night I could never forget. Tony had moved last year. He had to transfer from Sevier Middle to Northwood Middle. He was new and didn't know anybody. My friend Stacy had gone out with him back at Sevier (sadly, she didn't know that the only reason he went out with her was because someone had set them up). Anyways, I fell in love with him when he was with another girl. I told him I liked him and he said that he'd think about it. I told him to follow his heart, he didn't have to break up with his girlfriend because of me. Turns out, he did break up with her and went out with me. It was October 28, when he asked me to come over for Halloween. We spent all night together, then I had to go. His mom drove me home and we were in the back seat. My head was on his shoulders, he kissed my forehead, and we were holding hands... I looked up hoping to look into his eyes, turns out he was starring at my lips, waiting for a kiss. I was scared (this would be my first kiss) and I didn't know what to do, so I just looked out the window, hoping that he would change his mind and wait. Turns out, the third time I looked up to see if he was still starring, he took his finger and pulled my chin up till our lips met. It was a moment I could never forget. We have been together for about 2 or 3 months, than he had to break up with me because of his low grades. Two months later when his grades were back up, he asked me out again. Sadly, my parents are really strict and won't let me have any freedom until im 18, so I couldn't come over to his house and hang out. The only reason I was over at his house for Halloween was because I lied, I had said I was going to a friend's Halloween party and she was still planning it so her brother was to pick me up. I don't regret lying to my parents and nor will I ever. Our school had a band concert so I wanted to go to support my boyfriend. I asked my parents if I could go and they said yes, luckly they forgot that Tony was in band so I was able to go. After the concert, we went outside and stayed out there until about 2 hours later. We kissed and it was the first time I got to spend a special moment with him in the last 7 or 8 months. I love him very much and wish to be with him as long as I can. Such a nice time reading these stories... Thank you for posting your kisses experiences! Wish you all love and happiness! Such a lovely time reading these stories... Thank you for posting your kisses experiences! These stories are very interesting. For me, I can't remember any kiss. For I have never kissed someone passionately. For this reason I have learned what I miss in life. A kiss. I will go out and look for that kiss. Once again, I do appreciate. but these stories are like in the movies so beautiful.. I can remember my first kiss with my boyfriend too, he was really nervous, which was very cute. oh wow, I want to kiss him right now! This is just lovely! I love stories of the first kiss two people share together!